As part of the 10th anniversary celebrations ,Malayalam wiki society is organizing a study camp at Cochin on February 19th. The camp will be held at TocH public School from 2.pm till 5.00 pm. Anyone who are interested in Malayalam Wikipedia can participate in this programme. 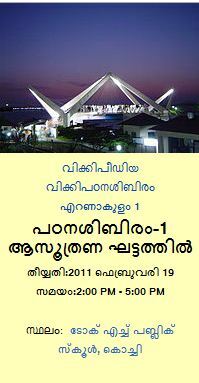 The camp will teach all the participants on actively using malayalam wikipedia contibutions. help will be provided to all those who intened to contribute in malayalam wikipedia. Those who wish to particiate can mail to help@mlwiki.in or log on to Malayalam Wikipedia page by clicking here. wow, that is good news . ..I think Tamil has the highest number of articles contributed to wikipedia right?